Not much analysis to do here, obviously (well, maybe not obvious to everybody), just wanted to include the best and worst odds I've seen. Unfortunately nobody is offering plus money on either side this year (it's been as high as +103 in the past). Anyway, just wanted to note how absurd it is to offer -115 on a coin toss when you offer -110 on sides, which are somewhat more predictable than, you know, a coin flip. If you're looking for a summary of coin toss results at each of the previous 46 Super Bowls (? ), you can always count on Stockle Mon. Who will the Super Bowl MVP thank first? An old friend. Eli didn't thank anyone when we won last year, so adding that to last year's chart, the winner has clearly been "Does Not Thank Anyone" in four of the past five years. And that's really more like 4.5/5, since some books graded it as a winner when Rodgers won two years ago. So at +190/+300, that is clearly the way to go on this one. Very disappointing that SBET is not offering "Does Not Thank Anyone" as one of their options. Who will the winning Super Bowl coach thank first? Same deal as above (see chart). There was some controversy on this one last year, but Sportsbook did grade DNTA as the winner. I think these odds are reasonable, to the extent that betting on Gatorade being dumped on a grown man can be "reasonable". 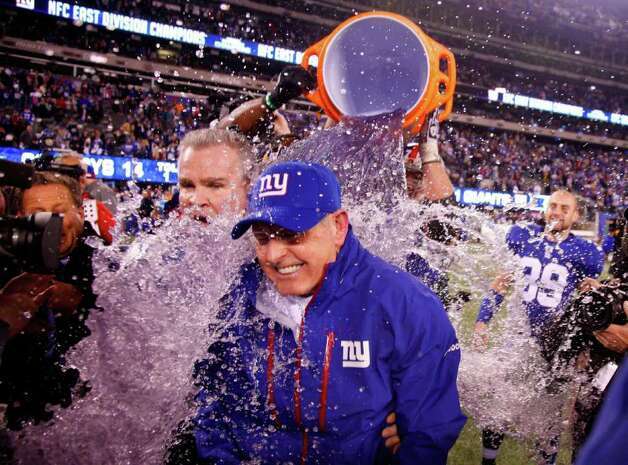 The Giants dumped purple Gatorade on Coughlin last year, which is (still) not even a listed color. "Clear" had a great run from 2005-2008, but it's now lost four times in a row, so that is sad. How long will it take Alicia Keys to sing the National Anthem? So that should be interesting, and could affect the props below. But for this one, between the uncertainty with her approach and lack of research materials, it's hard to know. When in doubt, just go for the available arbs/middles. Will Alicia Keys forget or omit at least 1 word of the official US National Anthem? Will Alicia Keys add at least 1 NEW word of the official US National Anthem? Will Alicia Keys play a piano during her rendition of the National Anthem? Quite a bit going on here. For not omitting a word, -250 seems pretty short. I think this is due to a) Aguilera screwing up two years ago, and b) Keys' aforementioned promise to mix it up a bit. But really, what Aguilera did seems pretty irrelevant, and while getting creative certainly increases the odds of a mistake, it's not like she can't practice in advance. I'd go with "No" on that one. Will Alicia Keys be booed during or after her rendition of the National Anthem? Would definitely stay away here. I'm not sure what exactly would have to happen for a Super Bowl crowd in New Orleans to boo the Anthem, but I'd say there's under a 16.7% chance that it happens here. BK is from Texas (sorry), so I think we can rule out 49ers and Ravens colors. Doesn't get us very far though. Honestly, I don't have much of an opinion here, just thought it was important to make a really forced reference and post the lines. Will Beyonce be joined by Jay-Z on stage during the Super Bowl halftime show? Another arb. Not sure what to do with this one beyond that; maybe there will be an angle on the Beyonce props coming out of her press conference (3pm EST on Thursday). As we have seen with the "Thanks" props, there can be some controversy on how these unusual props are graded. On the subject of Beyonce's hair, however, Bodog is getting out in front of this issue. This prop includes a link to a separate page, with examples of Beyonce with curly, crimped, and straight hair. Will Beyonce be showing cleavage during her first song? Okay, probably time to move on. I realize you could say this same thing about this entire post, but: who cares??? How many times will Harbaugh be said during the game? This would at least be fun to keep track of, and/or a good drinking game. No real opinion though; once about every three minutes seems reasonable. The "sharp" money has come in on the under thus far, as this one has come down from 7.5 seconds. I'd still go with the under -- that's a pretty long hug -- but they are brothers, and I'm sure there will be a decent amount of chatting involved, so who knows. From kick off until final whistle. Live pictures only, any taped pictures or past video does not count towards wager. Half time does not count towards wager. Must say full name. Book manager's decision is final. Included the fine print on this one since it seemed important. I would go under here. The game is on CBS, and in the past they haven't messed around much with nonsense like this. Add in the fact that pre-kickoff and halftime aren't included, and that all of these names are completely ridiculous/worthless, and I think this comes in at two or fewer. How many times will Jay-Z be shown on TV during the game? Same fine print as the "Har Bowl" prop. I would also go under here, since CBS does not generally pay much attention to celebrities during the actual game. My main concern would be that they show his wife in the second quarter when mentioning the halftime show, but it seems unlikely that they'd be sitting together at that point. If Ray Lewis is interviewed on TV after the game on the field or in the locker room how may times will he mention "God/Lord"? "Does Not Thank Anyone" is in some serious trouble if Ray wins the MVP. What will be the highest tweet per second during the Super Bowl? This one opened at 15,000, so has been bet up a bit. It looks like last year's game peaked at 12,223 TPS, which was up from 4,064 two years ago. A bit more recently, the Euro 2012 final maxed out at 15,358 TPS. These odds seem pretty reasonable, it probably just depends on whether there's one play that's especially notable. If there's something like Flacco-to-Jones for 70 yards on Sunday that would likely crush all these numbers.